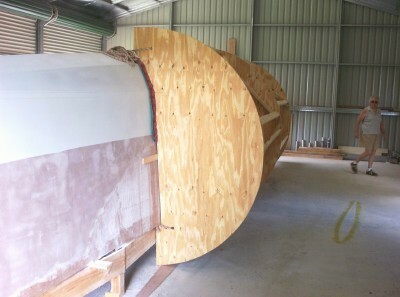 Turning the Hull - at last!! Well, Christmas has come and gone, and after much sanding, filling, sanding, etc., etc., the hull was finally ready for turning. To make it easy, and to keep things well controlled, I attached 3 semi-circular wheels to the hull. And so friends and family were assembled to turn it over. Everything went very smoothly with about a dozen people helping. We had to lift one side about 500mm before gravity took over. Then the roll was slowed down by three control ropes. A bit more juggling and the hull is now upright, and it's time to start on the next one!